We're sorry, the color Black (8001S) and Black #1 (8035S) is temporarily out of stock. Brand new and a must-have for any professional tattoo studio. 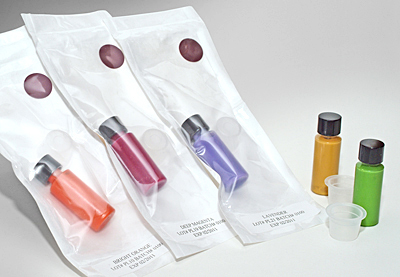 Our no hassle, single use bottles give you sterile color every time. Just shake the bottle to mix color – no need to risk cross contamination by stirring. The clear plastic allows you to see the ink color to determine if it is mixed. Box contains 20 sterilized packages of a single color (unable to mix a variety of colors in one box). Each sterilized package includes one 3 ml. bottle of ink and one #16 ink cap. Many colors to choose from with more on the way. Call for current availability.